A cut above the usual solid top/laminate travel guitars out there, it looks great and its sound will get you heard. Ideal for travelling/campfire playing. Very playable. Strong tones for a small guitar. Nice price. A few niggles with the setup. 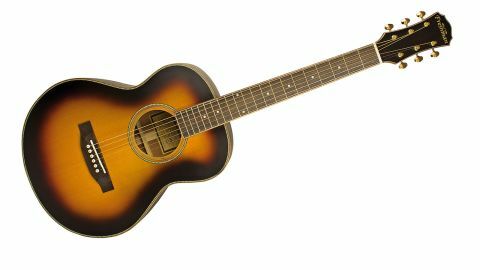 We looked at one of Freshman's new, all-solid wood full-size Songwriter acoustics back in August, and on the cute front this little 'traveller' wins hands down. "With almost electric-like playability, it'd make a great holiday/campfire guitar"
Centring on a 620mm (24.4-inch) scale, this 14-fret 'mini dreadnought' is just 350mm across its lower bout with a full-size depth of 112mm. The solid Sitka spruce top and solid mahogany back and sides have a fetching dark sunburst, highlighted with herringbone purfling and edged with what looks like light natural mahogany - also used with an inner white coachline, around the mahogany neck's mid-brown rosewood 'board and black-faced headstock. It's topped off with gold-plated, open-back Waverly-style tuners, bone nut and compensated saddle on a black- stained (probably rosewood) bridge with ivory-like pins. Like its bigger siblings, this traveller has a modern, bright tonality, it does sound very 'new' and the action seems a little low, although the nut was left rather high. A slight relaxation of the truss rod and cutting the nut not only loses the slightly buzzy-edged response, but also seems to add a little body to the sound and improves lower-fret intonation. With almost electric-like playability, it'd make a great holiday/campfire guitar, and its strong, mid-pushed voice will certainly get you heard. Solid-wood construction, clean build, good looks and slick playability (after a few tweaks), it has a quality gigbag and a tidy price. What's not to like?